Male jewelry is a notoriously difficult nut to crack. A little too much leather here and flashy bling there, and you start to look like Mr. T on a job interview. Introducing Miansai, your new home for handcrafted accessories fashioned from the most testosterone-fueled items on the planet. Recently launched by a Miami-based antique dealer's son, think of Miansai as the jewelry John Rambo would casually throw on after polishing off a couple local law-enforcement agents and a wild boar. The line runs the gamut from rings to bracelets to rosaries, all crafted from salvaged pieces of male badass like .38mm bullets, silver and brass knuckles and gold-plated razor blades. If you check out the site, you'll notice that each piece is made to look a bit vintage, as if it's something you might have picked up in a land-comb through Dresden circa 1946. The ribbon necklaces in particular evoke military glory, and feel more like wearing a pair of infantry dog tags than something you'd get at Tiffany's. 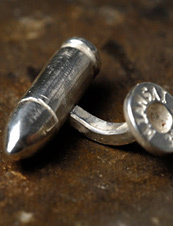 Meanwhile, the razor blade cufflinks and necklaces will add a touch of R.P. McMurphy edginess to any ensemble. We especially recommend them for your next business negotiation.